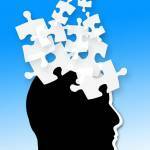 Alzheimer’s and other types of dementia cause brain cells to die and result in memory loss and cognitive decline. People with the disease start losing their ability to reason and communicate, experience trouble with basic daily tasks, and become unable to take care of themselves. As the disease progresses, problems like depression, paranoia, hallucinations, and aggressiveness become more and more severe – and family members get increasingly frustrated by their loved one’s anxious behavior, lack of rationality, and inability to communicate thoughts and feelings. The personality and behavioral changes in people struggling with Alzheimer’s make it seem like they’re not the same person anymore and leave caregivers disheartened and unsure of how to deal with the situation. If you have a loved one suffering from Alzheimer’s disease, you may be facing difficult challenges trying to provide them with care and support. Understanding the behavior of a person with AD and knowing how to deal with a loved one with Alzheimer’s can help lessen these difficulties, reducing the stress of caregiving and improving the quality of life of the affected person. 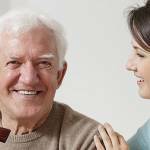 The first thing to do when a loved one is diagnosed with Alzheimer’s is to learn as much as possible about the disease – knowing how the disorder progresses and impacts the cognitive functions of the affected person will help you better understand your family member and provide them with effective care. Extreme anxiety about daily life – repeating information, asking for confirmation several times, preparing for appointments well ahead of time, etc. Inability to stay focused and coherent during conversations and events – getting easily distracted, jumping from one topic to another, telling the same story and asking the same questions over and over again, etc. Distrust of others – hiding things or believing that others are stealing from them, lying to them, etc. Poor judgment – falling for scams, giving away money, trusting strangers, etc. Inability to take care of themselves – not caring about how they look, going for days without bathing, wearing the same clothes every day, etc. The way people with Alzheimer’s act and behave may be frustrating and difficult to understand, but you need to remember that the reason for this behavior is the disease and the changes it causes in the brain. To reduce the anxiety, prevent conflicts, and ensure the comfort and well-being of a loved one with Alzheimer’s, you need to empathize with them and approach them with caution and compassion. Confront your own denial about the situation and don’t wait until a crisis happens to bring up the subject – start discussing Alzheimer’s with your aging relative and the rest of the family as soon as you get some sense of changes in your loved one’s ability to remember things or in their behavior. Talk to the person in a calm and supportive manner and reassure them that you and all the other family members are there for them. Provide a positive and supportive environment – limit distractions, sit close to your loved one (be sure to position yourself at their level), smile warmly, keep eye contact with them during the conversation, keep your voice calm and soothing, etc. Speak simply and clearly – say things one at a time, use short sentences and simple words, pause between sentences, repeat or rephrase when necessary, etc. Encourage your loved one to share their thoughts and feelings – give the senior time to think and speak at their own pace, ask supportive questions, do not interrupt them while talking, ask them to share stories from their childhood, recount happy memories, etc. Avoid confusions – refrain from asking too many questions and avoid complicated questions altogether, give your loved one simple choices, refer to people by name, etc. Prevent conflicts – do not argue with your loved one, don’t preach or accuse, don’t treat them like a child, don’t talk about them as if they’re not there, try not to show your frustration or anger, use humor when you can, etc. Use physical contact to get your loved one’s attention, convey your feelings, and provide reassurance. Be kind, patient, and compassionate. A person with Alzheimer’s may no longer be able to accurately interpret verbal or non-verbal cues, but an affectionate conversation is sure to ease their anxieties and make them feel connected to their loved ones. It is impossible to stop Alzheimer’s-related changes in personality and behavior, but caregivers can learn to cope with them, so they can still connect with their loved one through the disease and provide them with effective care and support. As much as you may want to make everything all right, things won’t be perfect – your loved one will get upset or agitated at times, there will be unavoidable confusions and conflicts, the home won’t be impeccably organized at all times, etc. Setting unrealistic expectations and striving for perfection as your loved one struggles with Alzheimer’s won’t do any of you any good and will cause you to feel exhausted and frustrated. Although difficult, try to accept success at 80 percent or so – as long as your loved one is safe, clean, comfortable, and calm, you have nothing to fret about. A set daily routine provides a sense of security and comfort – knowing what to expect at every time of the day and when a certain activity is going to take place helps eliminate confusion and frustration for your loved one and makes them feel safe and calm. A person with Alzheimer’s may have difficulty expressing their thoughts and wishes and may not be able to correctly interpret others’ words and actions. Be patient with them, break up new information into small pieces, give instructions one at a time, use words and phrases the person is well familiar with, avoid confusing pronouns and figures of speech, try to be as clear and concise as possible, repeat things as needed, and use physical contact and body language to make it easier for your loved one to grasp your meaning. Do not get offended or angry if the person says something inappropriate or gets you wrong – try to explain yourself more clearly and provide reassurance to your loved one. It’s important to remember that when people with Alzheimer’s are shouting or striking out, they do not intend to disrupt things or to hurt someone – they’re trying to convey a message that they can no longer explain in words. You need to learn to see the world through your loved one’s eyes and to respond to the “feeling” behind the behavior, rather than to the behavior itself. Remember who your loved one was before the disease and try to reach that person – memories from the distant past are not usually affected so it’s easier to awaken your loved one’s true self when talking about people, places, and experiences from the past. You can watch family videos and look at old photographs together, ask your relative to share stories with family members, coworkers, and friends, etc. This is fun for everyone and helps your loved one feel connected. Think about activities that are appropriate, achievable, and enjoyable for your loved one – consider what they liked doing before the disease, take note of the abilities that have been preserved, and focus on activities that make use of these capacities. Keep in mind that trying to learn new things or starting new hobbies may be frustrating or overwhelming for your loved one, so it’s important to stick to familiar activities. It is especially valuable to find activities that the two of you can enjoy together – going for walks, reviewing old photos, etc. Good to remember: Alzheimer’s is a progressive disease neither you nor your loved one can control – you need to recognize and accept the many aspects of the situation that are not in your control and focus on the things you can successfully deal with. Keep in mind though that your loved one’s symptoms and needs will change over time, so a successful intervention at one stage may become a frustration and disaster at another – your approach to the situation has to evolve together with the disease. 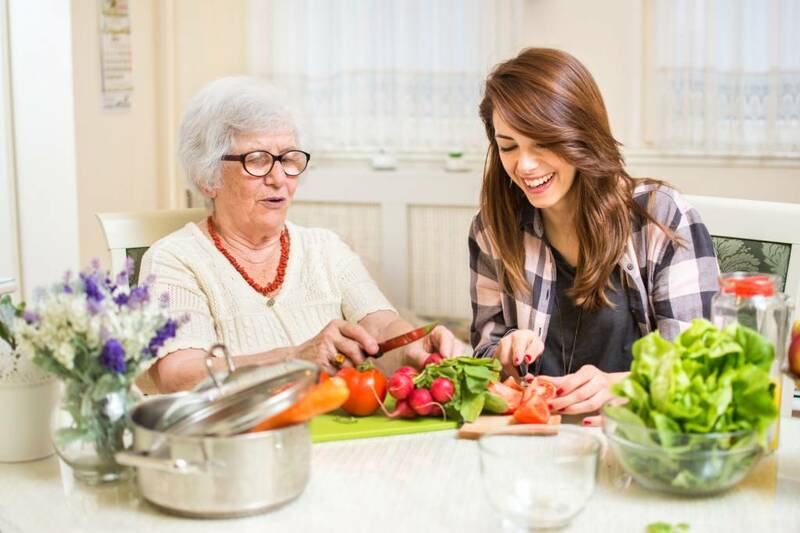 Ensure your loved one has a healthy and nutritious diet. Modify the home environment to limit your loved one’s exposure to potentially dangerous situations – install grab bars in risky areas, make sure all stairways have railings, apply anti-slip coatings to the flooring, ensure proper illumination throughout the home, etc. Do not argue or try to reason with your loved one – just drop the subject and take the conversation in a new direction. Contradicting the person directly, no matter how wrong they may be, is only going to make them anxious, upset, or angry and will do neither of you any good. Don’t ignore your loved one – they can remember emotions even after they forget the actual event that caused those emotions, so your actions and words matter a lot. Be sure to never talk about the person as if they’re not there and don’t dismiss their worries or neglect their feelings. Include your loved one in regular everyday conversations, even if it doesn’t matter what they respond – this will help them keep their sense of identity and self-worth and will reduce feelings of exclusion and isolation. Stimulate your loved one’s mind with interesting, thought-provoking activities – large puzzles, word games, card games, books, etc. Use every method of communication available to reach your loved one through the disease – singing, dancing, listening to music, reading aloud, etc. Learn to recognize what your loved one is communicating through their body language. Treat the person with respect and compassion. Know when you have reached your limits and look for help – ask family members to take over some of the caregiving responsibilities or hire a professional caregiver to look after your loved one with Alzheimer’s. However committed and compassionate a person may be, caring for a loved one with Alzheimer’s can be devastating. It’s normal for family caregivers to feel frustrated, helpless, and depressed as they witness a loved one turning into a shadow of their former self. 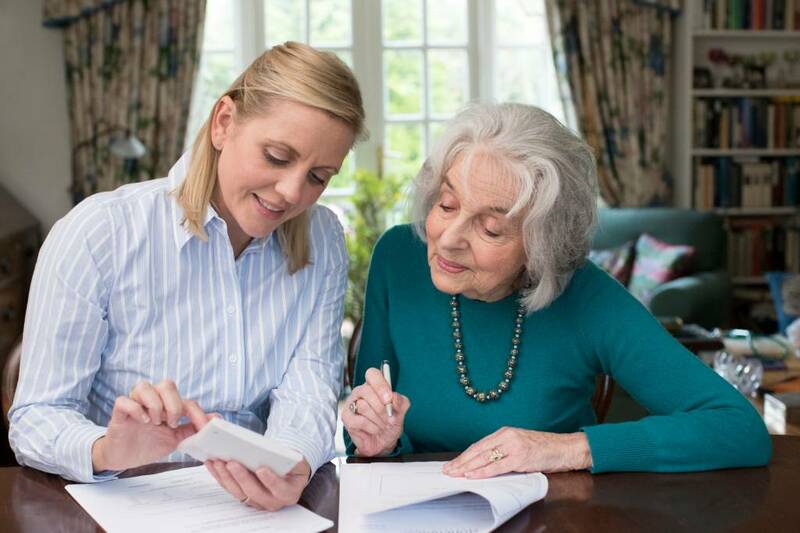 Using professional dementia care services can help relieve the stress and improve the quality of life of both the family caregiver and their loved one – an experienced specialist will not only provide effective care to the affected person, but will also offer emotional support and friendly companionship. At Assisting Hands Home Care, we provide Alzheimer’s care to help seniors with the disease live safely and comfortably in their own homes. 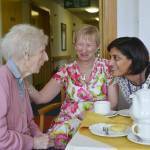 We take a person-specific approach to Alzheimer’s and develop a care plan that perfectly suits the needs and preferences of the affected individual and their family. Our experienced caregivers show compassion and respect to the elderly and engage them in enjoyable activities, interesting conversations, and mind-stimulating games to keep them mentally challenged and socially active. 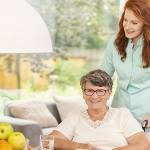 If you have a family member in the Hollywood, FL area who suffers from Alzheimer’s or dementia, Assisting Hands Home Care is there for you – call us at (954) 644-7276 for more detailed information about our home health care services and rest assured that your loved one will receive the best care possible.